Jetpack 3.8 is available for download and includes, Google+ badges, Twitch.TV embed shortcode, improvements to the contact form module, and bug fixes. Users can now display a Google+ Badge widget that shows your Google+ profile, page, or community. You can configure the badge’s width, layout, and choose between a light or dark color scheme. A Google+ icon has also been added to the Social Media Icons widget bringing the total number of available icons to nine. Those who use the Shortcode Embeds module can now easily embed videos from Twitch.tv using [ twitchtv ] shortcode. The shortcode’s attributes allow you to modify the width, height, and whether or not the video autoplays. In Jetpack 3.8, check box field types can have multiple items. Jetpack 3.8 include other notable improvements, so if you’re interested to know them you check at Jetpack 3.8 Adds Google+ Badges and Fixes Contact Form. In a typical brute force attack, several machines or bots try to guess the username and password for a site one at a time. In a brute force amplification attack, attackers can guess hundreds or thousands of combinations within a single request making the attack more efficient and difficult to block. Jetpack comes with a module called Jetpack Protect formerly known as BruteProtect, that protect sites from brute force attacks. Sam Hotchkiss, lead developer of Jetpack Protect, confirms in a blog post that Jetpack Protect blocks brute force amplification attacks out-of-the box. To check the blog post of Sam Hotchkiss of Jetpack Protect, visit here. But now, you can browse and install plugins from the WordPress plugin directory on sites you own that use Jetpack with Manage module activated. 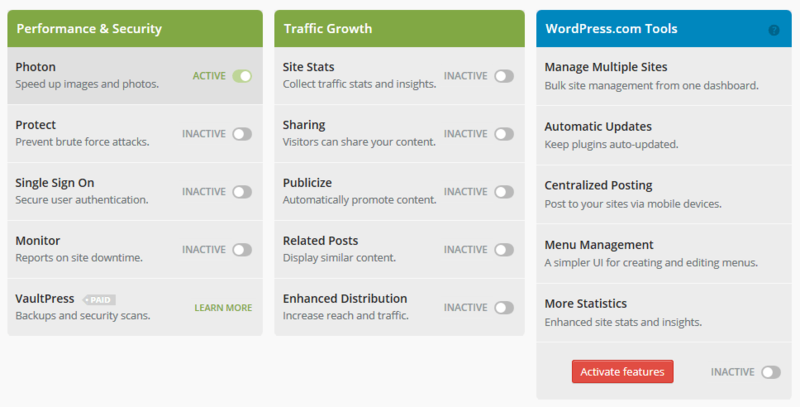 Visit https://wordpress.com/plugins/browse and choose the site you want to manage. Check for the Configure area on the sidebar and click the Add button to open the plugin browser. A plugin browser to search for and install plugins is another feature that makes Jetpack Manage a free, decent alternative to commercial services for managing multiple sites. Jetpack 3.7 is available for free from the WordPress plugin directory and includes a simpler user interface, support for development sites, and fixes issues. One of the biggest drawbacks to Jetpack is switching between local servers. If you move your site from one URL to another, Jetpack automatically detects the change and prompts the user to confirm if the URL is correct. If Jetpack thinks two URLs are separate websites, it recommends that you create a new connection to prevent a service interruption on the original domain. The VideoPress player in Jetpack 3.7 works on mobile devices thanks to its responsive redesign. Having this enabled allows you to easily embed VideoPress powered to your site by copying and pasting the video’s URL into visual editor. The ability to enable per-post opt-out for Subscriptions. A new Widget Visibility rule. Share button on bbPress forum posts. For more information about the Jetpack3.7, visit at Jetpack 3.7 Introduces a Simpler Interface.